The phrase “faceless bureaucrat” is generally not meant as a compliment. 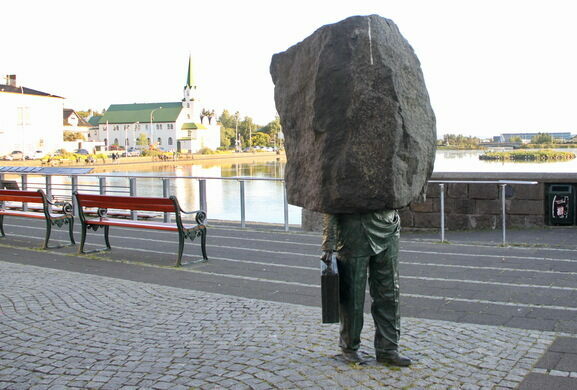 But in Reykjavik, these seemingly anonymous workers are immortalized in art. There, next to a duck pond, stands a statue of a man wielding a briefcase, walking toward city hall. It’s a common everyday sight; a depiction of the everyday “faceless” city officials on their way to work. However, this official is a bit different from its living inspirations, as it is literally faceless. A large slab of Icelandic volcanic basalt sits where you would expect to see a torso and head. 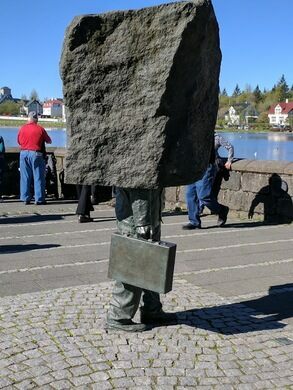 The unique statue was sculpted by Magnús Tómasson in 1994, and you’ll have to decide for yourself whether it was meant as a serious tribute, or a humorous, satirical piece. Monuments to an unknown soldier are common around the globe, but as Iceland has no standing army, perhaps a tribute to the civilians who serve their country is the next best thing. 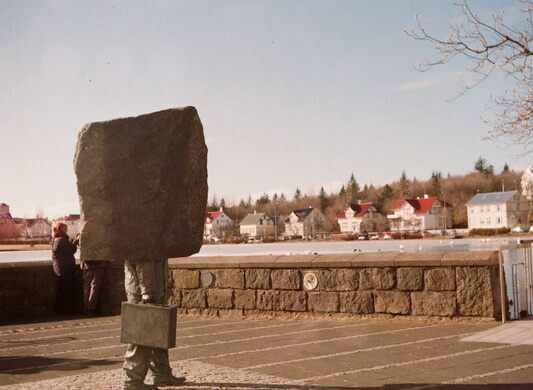 The monument is a short walk from the Reykjavík Official Tourist Information Centre, so you can easily pass by it while on your way to plan your adventures within and outside the city. A charmingly eccentric magma chaser presents his complete history of the island's eruptions since 1947, in cinematic form, just for you. This monument to one of the largest science fiction games of all time bears the names of hundreds of thousands of players. This massive monument was unveiled the day Kosovo declared independence from Serbia.